The internet generally becomes an annoying cesspool of lame jokes on April Fool's Day, especially in the arena of online shopping, but today one site's April Fool's goof did manage to elicit a smile from me. Hip, do-gooder eyewear maker Warby Parker unveiled a new "collection" of eyewear for dogs. 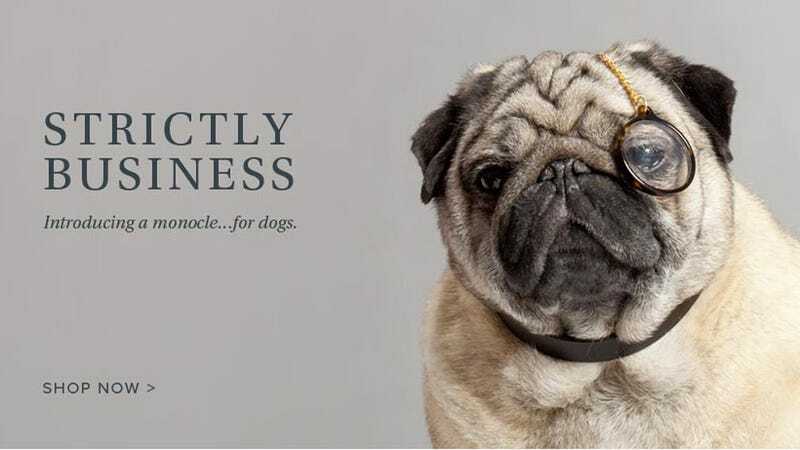 Appropriately called Warby Barker, they designed an impressively thorough website to perpetrate this joke, and the collection even includes a monocle for dogs—which, why can't dogs actually start wearing stylish monocles every day? They get also bonus points for encouraging donations to the humane society and for including the question, "How much is that doggie in the window?" in their FAQ section. And now, let us put this April Fool's Day to rest and drift off to a dreamland filled with dogs (and cats too, if that's your thing) in gorgeous glasses.